An added inscription lower left: John Duke of Argyll &/Greenwich. Aikman was particularly favoured by the Duke: ‘His Grace of Argyll is as much my friend as ever and every day I have some marks of it …’ he wrote from London in 1724. His many portraits of Argyll are difficult to date, such is their similarity. Although one has been dated before 1710,  many, perhaps most, must have been painted between 1712 and 1722 in Edinburgh,  where Aikman was based, save for periods of study in London 1704-07 and travel in Italy 1707-11, before he finally settled in London in 1723. 1) J. Holloway, Patrons and Painters, Scottish National Portrait Gallery, 1989, p 51 citing SRO, GD 18/4595. 2) ‘Aikman painted at least three different full-length versions, seven three-quarter lengths and five half lengths and made many copies of them as well’ (J. Holloway, William Aikman, 1988, p 12). 3) O. Millar, The Tudor, Stuart and Early Georgian Pictures in the Collection of Her Majesty The Queen, 1963, no.502; if the portrait was painted ‘before 1710’ it must have been before 1707 when Aikman went abroad. 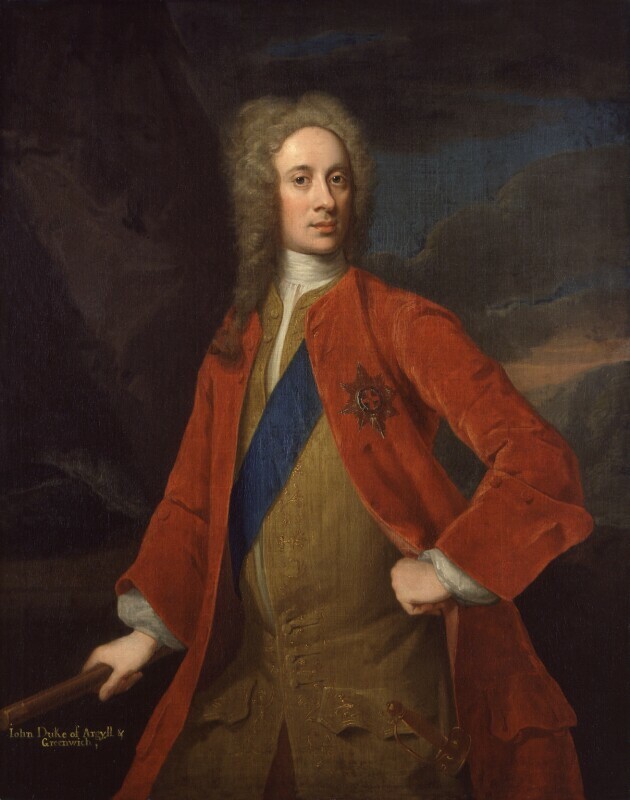 4) Holloway also has supposed that many were painted in Edinburgh in 1712-23, ‘not all ... for the Duke; some were painted for his more important political allies and kinsmen. Lesser Campbells and placemen were satisfied by one of the nine different prints ...’ (J. Holloway, William Aikman, 1988, p 12). F. O’Donoghue & H. M. Hake, Catalogue of Engraved British Portraits in the … British Museum, lists five near contemporary prints of Aikman portraits. 5) A bust-length by Aikman in a painted oval at Abercairny (inscribed Jas 5th Earl of Perth d.1720) has a younger look but may show Argyll. D. Piper, Catalogue of the Seventeenth Century Portraits in the National Portrait Gallery 1625-1714, 1963, p 12. The 12th Duke of Hamilton, Hamilton Palace sale, 8 July 1882, lot 1094, bought Colnaghi; bought Henry Graves, from whom purchased 1885. This extended catalogue entry is from the National Portrait Gallery collection catalogue: John Ingamells, National Portrait Gallery: Later Stuart Portraits 1685–1714, National Portrait Gallery, 2009, and is as published then. For the most up-to-date details on individual Collection works, we recommend reading the information provided in the Search the Collection results on this website in parallel with this text.